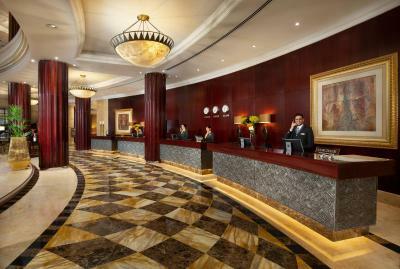 Lock in a great price for Beach Rotana - Abu Dhabi – rated 8.5 by recent guests! Very friendly amd helpful staff. Room very clean and comfortable. Great location too! + very nice and clean place. + good for business trips. Staff was very friendly & helpful. Overall it was very nice weekend. The staff treated us well. The food was delicious. The hotel location was very convenient. It’s a very nice hotel, i always stay there. Great location and facilities. Very nice restaurants and very friendly and professional team. The beach and pool are also nice. Kind of resort in fact. Connected to Abu Dhabi mall. We had a very comfortable room. The room was very clean with a nice view. The staff was very friendly. The breakfast was really excellent. Good clean rooms, good service.- amazing location and their club lounge is small but cute. Joseph and bharat served really well in the club lounge. Amazing balcony view. Bed was comfortable. Room service was excellent Hotel located right next to Abu Dhabi mall with its own entrance. Everything was really good. 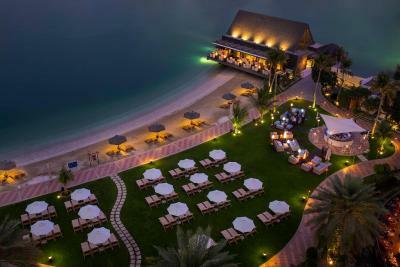 Has its own private beach, connected to Abu Dhabi Mall, walkable to many other food places, excellent staff - helpful and friendly. Really great stay! 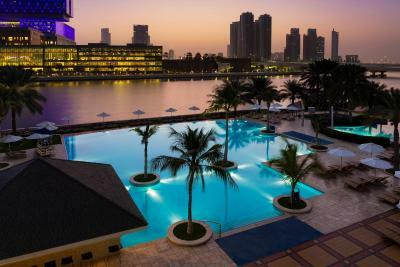 Beach Rotana - Abu Dhabi This rating is a reflection of how the property compares to the industry standard when it comes to price, facilities and services available. It's based on a self-evaluation by the property. Use this rating to help choose your stay! 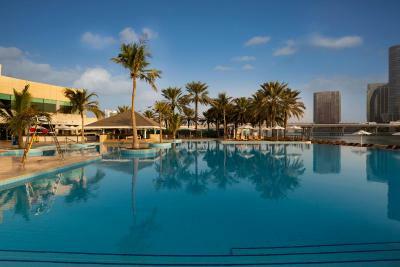 The Beach Rotana hotel features spacious and elegantly decorated rooms and suites. Some rooms have balconies with sea views. Fully-furnished apartments and suites are located adjacent to the hotel. The hotel has its own tennis and racquetball courts. Around the pool there is a deck with lounge chairs in the middle of palm trees. 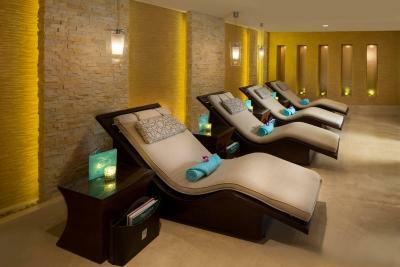 Guests can use the spa facility or enjoy a massage and steam bath. There is also a Printspot mobile printing service. Beach Rotana - Abu Dhabi is in Al Zahiyah Area (Tourist Club Area) of Abu Dhabi, only a 5-minute drive from the Gold Souk. 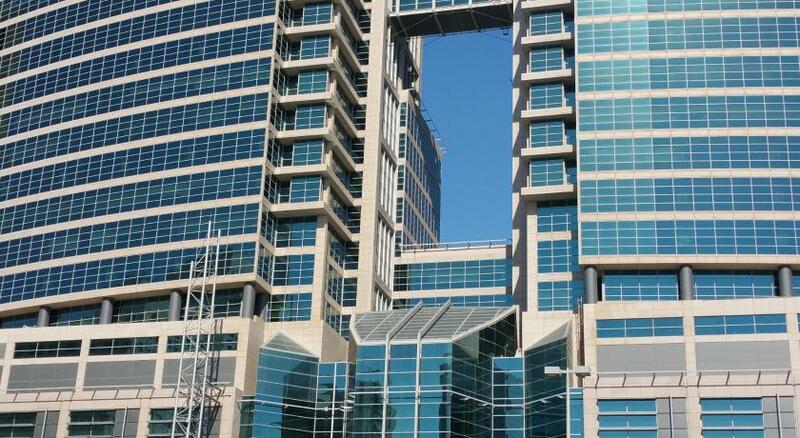 The underground parking garage is free of charge and the front desk is open 24/7. 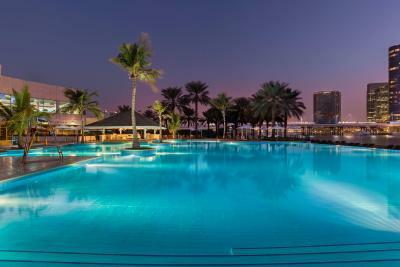 When would you like to stay at Beach Rotana - Abu Dhabi? The Classic Room has 30 sqm. In addition to the standard facilities it features a private balcony. The view differs from room to room. Each classic room has its own bath and shower, a mini-bar, tea/coffee making facilities, individually controlled air-conditioning, a multi-satellite TV, IDD and wireless high speed internet connection, a working desk, voice mail and an in-room safe. The Club Rotana Room has 40 sqm and is located in the Tower Wing with a private balcony overlooking the bay. With this room you are entitled for complimentary access to the Club Lounge, express check-in and check-out, buffet breakfast, afternoon tea and coffee, evening cocktails and canapes and free internet use at the lounge. Each room has its own separate walk-in rainforest shower, a mini-bar, tea/coffee making facilities, individually controlled air-conditioning, a multi-satellite TV, IDD and wireless high speed internet connection, a working desk, voice mail and an in-room safe. This one-bedroom suite is located in a separate building, 492 feet from the main hotel entrance, that offers direct access to the Abu Dhabi Mall and Hyper Market. It includes a separate living room with a mini-bar and a tea/coffee maker. Guests can enjoy complimentary access to Beach Club. This room is located in the new Tower Wing with a private balcony. 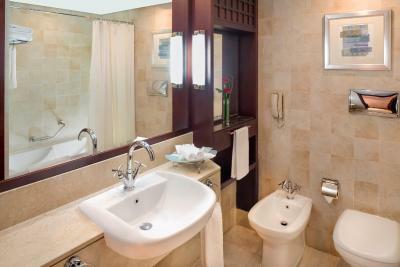 Each room has its own separate walk-in rainforest shower, mini-bar, tea/coffee making facilities. All rooms are equipped with individually controlled air-conditioning, with multi-satellite colored TV, IDD and high speed internet connection, working desk, voice mail and in room safe. The Premium Room has 40 sqm and is located in the Tower Wing with a private balcony. 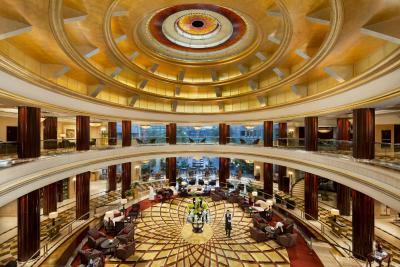 All Premium Rooms overlook the bay and Abu Dhabi Mall. Each room has its own separate walk-in rainforest shower, a mini-bar, tea/coffee making facilities, individually controlled air-conditioning, a multi-satellite TV, dual port for voice, IDD and wireless high speed internet connection, a working desk, voice mail and an in-room safe. With 145 sqm in size, the Premium Suite has one bedroom with separate living room, two private balconies, a dining table for four people, a walk-in rain shower in addition to all other suite facilities. It includes a mini-bar, coffee and tea making facilities, two multi-satellite TV, individually controlled air-conditioning, IDD and high speed wireless internet, work desk, voice mail and an in-room safe. The Club Rotana Suite with King size Bed is 145 Square Yards, one bedroom with separate living room located in the new Tower wing with 2 private balconies. Each room has its own rainforest walk-in shower. The living room has one sofa with two side chairs and dining table for 4 people. All rooms are equipped with individually controlled air-conditioning, with 2 multi-satellite colored TV, DVD player, IDD and high speed internet connection, working desk, voice mail and in room safe. With this room you are entitled for complimentary access to the Club Lounge, express check in and check out, buffet breakfast, afternoon tea and coffee, evening cocktails and canapes, free internet use at the lounge. The child policy is *Children below 12 years old can only visit the lounge between 09.00 AM and 17.00 hrs only. The Royal Suite at Rotana Beach Abu Dhabi is 240 square yards and consists of of one bedroom with two private balconies, a dining table for ten people and a walk-in rain shower. It also includes a mini-bar, coffee and tea making facilities, two multi-satellite TV, individually controlled air-conditioning, IDD and high speed wireless internet, work desk, voice mail and an in-room safe. The Beach Suite has 710 ft² of space. In addition to the standard facilities, it features two private balconies. Facilities include daily housekeeping service with evening turndown, fully stocked minibar upon request, personal in-room safe, 32-inch LCD TV, multilingual satellite TV channels including music channels, bathrobes, hairdryer, IDD telephone, individual air temperature control, tea and coffee-making facilities, high speed internet connection and laundry services. 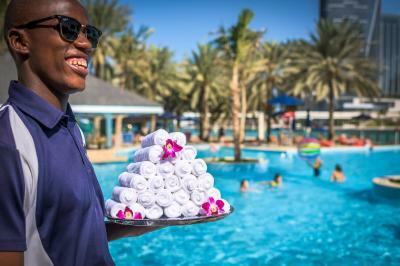 House Rules Beach Rotana - Abu Dhabi takes special requests – add in the next step! 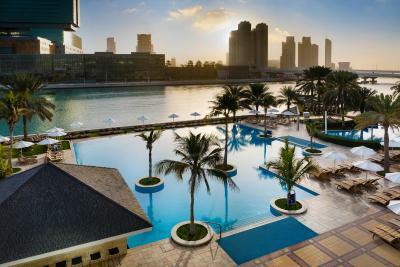 Beach Rotana - Abu Dhabi accepts these cards and reserves the right to temporarily hold an amount prior to arrival. For any advance purchase reservation, the credit card used for payment must be presented upon check-in. Please inform Beach Rotana - Abu Dhabi of your expected arrival time in advance. You can use the Special Requests box when booking, or contact the property directly using the contact details in your confirmation. Friendly staff, clean room & comfortable bed. Quiet. It was a short trip to attend an engagement party: arrived at 6.30 pm & left at 7 am. It was pleasant stay and served the purpose very well. The friendly staff, the view was amazing and the food was great. The pool got very busy at weekends. And the loos near the pool ideally needed a permanent staff member to keep them clean. We joined the club + had breakfast there everyday. Very good choices. Valet parking took too long and were not very friendly. Also room could have been bigger. A perfect hotel, nothing negative to mention!!!!! What do you expect from a 5 star hotel? Large, spacious rooms. Recreation areas that leave nothing to be desired. Staff that is always there, whenever you need something. Competent advice on activities outside the hotel such as tours, table reservations etc. 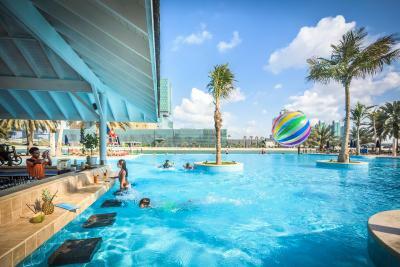 We, a family of 4, stayed at the Rotana beach from April, 13 to 18and the hotel completely convinced us. Every wish is read from the eyes of the guests, the equipment corresponds in every detail to a 5 star hotel and has made our stay a memorable one. The employees are extremely attentive, competent and helpful, but I have to highlight one of them. Mr. Salman, who works in the concierge area, deserves special mention. You need something, ask Salman. There is a rating for hotels, Salman i would call a 5 star concierge, he personally feels responsible for the well-being of his guests and there’s nothing more a guest can not expect or need. The bathrooms were on the smaller side compared to other hotels of a similar standard in UAE. Good location and a nice hotel overall. Many restaurants, so lots of dining options. Pool bar service very slow, twice tried to charge full price during happy hour. Strongly recommend a clock so all can see the time. Why is happy hour cost not automatic from 6 to 8 by the till's. Twice in 5 days I had spot the over charge.